Despite years of investigation, very little is known about the genetic predisposition for gestational diabetes mellitus (GDM). However, the advent of genome-wide association and identification of loci contributing to susceptibility to type 2 diabetes mellitus has opened a small window into the genetics of GDM. More importantly, the study of the genetics of GDM has not only illuminated potential new biology underlying diabetes in pregnancy, but has also provided insights into fetal outcomes. Here, I review some of the insights into GDM and fetal outcomes gained through the study of both rare and common genetic variation. I also discuss whether recent testing of type 2 diabetes mellitus susceptibility loci in GDM case-control samples changes views of whether GDM is a distinct form of diabetes. Finally, I examine how the study of susceptibility loci can be used to influence clinical care, one of the great promises of the new era of human genome analysis. Gestational diabetes mellitus (GDM) refers to hyperglycemia that first presents during pregnancy and typically resolves itself post-partum. There are inadequate data on the prevalence of GDM; however, in 1988 it was estimated that about 4% of pregnancies in the United States were complicated by diabetes, with 88% of these accounted for by GDM . More recent data suggest that, as with the overall increased prevalence of diabetes, rates of GDM are significantly increasing . For example, Dabelea and colleagues  examined trends in singleton pregnancies from the Kaiser Permanente health maintenance organization of Colorado between 1994 and 2002 and noted that rates of GDM increased two-fold in all ethnic groups. Accurate data on the prevalence and incidence of GDM are likely to become available given that screening during pregnancy is almost routine and consistent diagnostic criteria are now being implemented . Hyperglycemia during pregnancy, whether due to GDM or other forms of diabetes, has implications for mother, developing fetus, and child. Women diagnosed with GDM have a higher risk for future type 2 diabetes mellitus (T2DM) . Kjos et al. were the first to demonstrate that this risk was even higher in Hispanic women with previous GDM by showing that 45% of a cohort followed for 5 years post-partum developed T2DM despite plasma glucose returning to non-diabetic levels. The observation that previous GDM increases risk for future T2DM was subsequently confirmed in other ethnic groups . Women with GDM have a higher rate of caesarean section, gestational hypertension, and large for gestational age deliveries . Maternal diabetes has been shown to be associated with increased risk for macrosomia [8, 9], and GDM-associated macrosomia is associated with increased rates of a variety of complications, including hypoglycemia and respiratory distress syndrome . Pettitt et al. were among the first to show the association between maternal hyperglycemia and increased risk for babies large for their gestational age or macrosomia, with implications for additional morbidities in adulthood . For example, Pima Indian women whose birth weight was over 4,500 g had a four-fold higher risk of developing GDM when they became pregnant as adults . Also, in siblings born from pregnancies discordant for diabetes, but who were raised in similar environments, the sibling born from the diabetic pregnancy was more obese than the sibling born from the non-diabetic pregnancy . New insights into pregnancy-related outcomes are now becoming available from the Hyperglycemia and Adverse Pregnancy Outcome (HAPO) study . HAPO is a prospective observational study of over 25,000 pregnant women in nine countries who underwent an oral glucose tolerance test (OGTT; 75 g glucose administered orally, followed by blood sampling at 2 hours) at 24 to 32 weeks of gestation, with assessment of several maternal and fetal outcomes. The HAPO study is already providing some new insights into the management of GDM  and has shown that body mass index (BMI), independent of glycemia, was associated with the frequency of excess fetal growth and pre-eclampsia . The HAPO study should provide many new insights into the relationship between maternal hyperglycemia and pregnancy-related outcomes. Here, I review the current state of knowledge regarding genetic susceptibility to T2DM and its implications for GDM. The physiological implications of mutations underlying monogenic forms of diabetes and polymorphisms underlying complex forms of diabetes are also considered (Table 1). The issue of whether GDM and T2DM are distinct diseases and whether genetic information can shed additional light on this controversy are discussed. Finally, a brief discussion of the clinical implications of genetic variation is provided. The study of genetics in GDM has been relatively lacking until the recent advent of genome-wide association (GWA) studies (see below). Such studies have been partly hampered by the lack of evidence for a genetic basis for GDM. That is not to say that GDM does not have a genetic basis, but that the ability to accurately assess familiality of GDM is limited. Twin concordance rates, familial risk estimates, or heritability studies have been used to provide evidence of a genetic basis for a given phenotype. Prospective studies are complicated by the need to study related individuals presenting with GDM, a very daunting task. Retrospective studies are also fraught with difficulties. The diagnostic criteria for GDM have changed over the years [4, 17–20], complicating retrospective identification of GDM cases. Screening for GDM has not been a part of routine medical care until recently. These factors can lead to ascertainment bias and poor estimates of heritability. Finally, the very low prevalence of GDM, relative to the population and to other forms of diabetes, makes it difficult to accumulate sufficient samples for genetic studies. Several studies have examined clustering of GDM with either type 1 or type 2 diabetes. For example, McLellan and colleagues  identified 14 women with a previous diagnosis of GDM with both parents available for study and noted that glucose intolerance was observed in 64% of the parents. Similarly, Martin et al. showed that a higher than expected number of mothers with diabetes was observed in 91 women with GDM. These and other similar studies hint at the possibility of common genetic determinants for GDM, although the effect of in utero hyperglycemia on offspring with implications in adulthood cannot be discounted. We reported an estimated sibling risk ratio for GDM of 1.75, which was based on state-wide medical record information from the state of Washington . Although this estimate suggests an increased sibling risk for GDM, it is likely this is an underestimate of the true risk given the methodological complications noted above. For a good description of candidate gene studies for GDM, see a recent review by Robitaille and Grant . One issue regarding early genetic associations is that they rarely replicated across studies, partly owing to the fact that gene effects are relatively small and most candidate gene studies were under-powered. However, studies of monogenic forms of diabetes, specifically maturity-onset diabetes of the young 2 (MODY2), provided some of the first insights into the contribution of genetic variation to hyperglycemia observed during pregnancy and fetal outcomes. MODY2 is an autosomal dominant form of MODY due to mutations in glucokinase (GCK) [25–27]. Physiological studies revealed that the hyperglycemia observed in patients with MODY2 mutations is due to a rightward shift in the insulin secretory dose response to glucose . This rightward shift indicates that MODY2 patients can dynamically respond to glycemic excursions, but at a higher glucose set point. Thus, MODY2 patients are typically treated by lifestyle modification and remain modestly hyperglycemic relative to the non-diabetic population. Early evidence suggested that females with GCK mutations frequently presented with GDM, as suggested by the observation that 7 of 11 parous women from two pedigrees with a specific GCK mutation were diagnosed with GDM [28, 29]. Hattersley and colleagues  posited that the association between low birth weight and subsequent insulin resistance in adulthood is genetically determined, presumably a result of GCK mutations, and introduced the 'fetal insulin' hypothesis. An important component to this hypothesis is that low insulin-mediated fetal growth in utero is determined by a defect in glucose sensing by the pancreas due to GCK mutations, resulting in reduced insulin levels during critical periods of growth and development of the fetus. 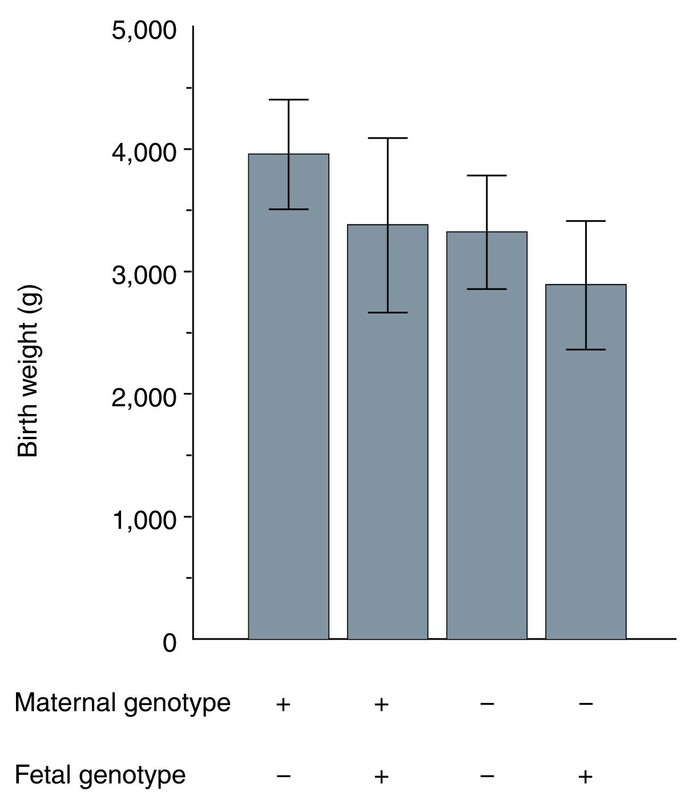 In partial support of this hypothesis, they showed  that maternal hyperglycemia due to GCK mutations was associated with an increased birth weight that was a consequence of additive effects of the maternal and the fetal GCK genotype (Figure 1). They further showed  that in sibling pairs discordant for GCK mutations, the sibling with the GCK mutation had a lower birth weight than the sibling without the mutation. They proposed that differences in birth weight in their sample were a consequence of a direct effect of fetal GCK mutations on fetal insulin secretion and an indirect effect of maternal hyperglycemia due to GCK mutations in the mothers. Effect of maternal and fetal GCK genotype on birth weight (mean ± SD). Birth weight decreases as a function of the presence (plus sign) or absence (minus sign) of GCK mutations in the mother and fetus. Adapted from Table 1 of . It should be noted that common variants in GCK also seem to contribute to maternal hyperglycemia that subsequently affects birth weight. A large-scale meta-analysis confirmed observations from previous studies that the -30 promoter variant in GCK (rs1799884) was associated with both fasting glucose and birth weight [32, 33]. The presence of at least one copy of the maternal A allele increased birth weight by an average of 64 g compared with G/G homozygous individuals, with weak evidence for an additive effect of the maternal A allele . Furthermore, analysis of a subset of the data suggested that the effect of rs1799884 on fasting glucose partly explains the association with birth weight. Fetal genotype information was available on a subset of the data, but this study  was not able to demonstrate any interaction between maternal and fetal GCK genotypes. The introduction of GWA has transformed the study of complex disease genetics and GWA studies of T2DM have been at the forefront of this new era of human genetics. Only three T2DM susceptibility loci had been identified before 2007: two identified by candidate gene analysis [34, 35] and one by fine-mapping of a linkage signal . GWA meta-analyses of T2DM and of T2DM-related quantitative traits have resulted in identification of 38 T2DM susceptibility loci so far; most have been identified within the past 3 years [37–50]. The assembly of ever larger samples coupled with the increasing application of whole genome sequencing will probably identify additional susceptibility loci. However, even the currently known loci have illuminated new biology underlying T2DM, such as MTNR1B (encoding a member of the melatonin receptor family) [45, 46] and CRY2 (encoding a member of the cryptochrome family that regulates the clock gene) , which point to regulation of 'clock' genes and circadian rhythms as contributing to T2DM pathogenesis. How has the discovery of T2DM susceptibility loci contributed to our understanding of the genetics of GDM? Two groups have examined whether T2DM susceptibility loci identified by GWA are also associated with GDM [51, 52]. Cho et al. examined 18 single nucleotide polymorphisms (SNPs) in nine T2DM susceptibility loci and tested them for association with GDM in a large case-control sample of Koreans. CDKAL1, encoding a protein of unknown function but having high sequence homology with proteins regulating cyclin-dependent kinase 5, and CDKN2A and CDKN2B, two genes involved in cell cycle regulation, all showed strong evidence for association with GDM. Interestingly, the odds ratios for GDM were slightly higher (about 1.5) than the odds ratio of about 1.2 typically observed for T2DM. One possible reason for the larger effect size in this study may be the fact that the control group consisted of non-diabetic individuals of both sexes. Alternatively, these specific loci may make a larger contribution to the genetic risk for GDM than for T2DM. Other loci, HHEX (encoding a transcription factor involved in development of the ventral pancreas and possibly the liver), IGF2BP2 (encoding a protein that binds to the 5'-UTR of insulin-like growth factor-2 mRNA and that may regulate translation), SLC30A8 (encoding a zinc transporter found on insulin secretory vesicles), and TCF7L2 (encoding a transcription factor), showed modest evidence for association with GDM, with P-values ranging between 0.038 and 0.003. The odds ratios for risk for GDM across these loci were similar to those observed for T2DM. Similar to the study of Cho et al. , Lauenborg and colleagues  examined the association between 11 T2DM susceptibility loci for association with GDM in a Danish case-control sample. In their study , only TCF7L2 showed strong evidence for association with GDM, with an odds ratio similar to that observed for T2DM. Two additional loci, CDKAL1 and HNF1B (encoding a member of the homeodomain-containing family of transcription factors), showed marginal association with GDM. 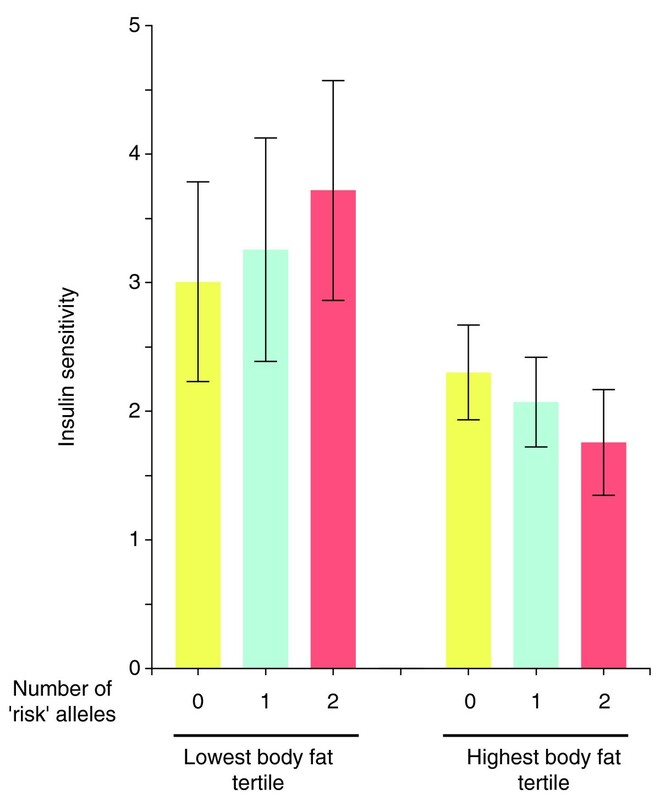 They subsequently derived an allelic score for each individual by counting up the number of 'risk' alleles carried by each individual across the 11 loci and showed a difference in distribution of these allelic scores when comparing GDM with non-GDM women. Overall, they estimated the odds ratio for GDM to be 1.18 per allele in their sample after adjusting for age and BMI. Also, there was a 3.3-fold increased risk for GDM when they compared women carrying fewer than nine risk alleles with those carrying more than 15 risk alleles. Lauenborg et al. then tested whether these 11 loci can be used to predict GDM by comparing various logistic-regression-based models, assuming the 11 loci worked in an additive manner, and computing the receiver-operator curve (ROC) area under the curve (AUC) as a metric of accuracy. Age and BMI alone had an AUC of 0.68, suggesting a relatively poor ability to predict GDM. The 11 T2DM susceptibility loci had an AUC of 0.62, which was similar to the model with age and BMI alone. The AUC increased to 0.73 when the two were combined. There are important points to be noted from the ROC results. First, not surprisingly, age and BMI alone are inadequate for discriminating GDM, suggesting that other clinical variables, such as the OGTT [4, 53], may provide better discrimination. Second, many would view the near equivalent AUC between the non-genetic and genetic models as evidence for a lack of a genetic basis for GDM, but it should be noted that comparison across models used for ROC analysis cannot be used to assess whether a phenotype has a genetic basis or not. Furthermore, it is important to remember that these are known T2DM susceptibility loci and not necessarily susceptibility loci for GDM. Thus, there is no a priori reason that these loci should provide adequate discrimination of GDM. Finally, the genetic variants identified by GWA are only landmarks indicating the possible presence of a T2DM susceptibility variant. Additional work is necessary to identify the functional variant responsible for the increased T2DM risk and, once those variants are identified, it is possible the performance of genetic models may improve. The studies by Cho et al. and Lauenborg et al. suggest that GDM does not have a unique genetic predisposition and, at a minimum, that there is some overlap in genetic susceptibility to GDM and T2DM. This, of course, does not exclude the possibility that there are some loci uniquely contributing to the risk for GDM. The overlap in genetic susceptibility may partly explain the increased risk for T2DM in women with previous GDM [5–7]. Given this observation, an important question is what the implication is for family members of a woman with previous GDM. There are precious few family-based studies of diabetes and even fewer studies examining critical diabetes phenotypes, given the shift to GWA studies based on case-control samples. Although there are family-based studies of T2DM in Hispanics [54–63], so far none are examining interactions among genes or with environmental exposures. Furthermore, only the Insulin Resistance Atherosclerosis Study Family Study  has direct measures of insulin resistance and insulin secretion, in their case based on frequently sampled intravenous glucose tolerance test (FSIGT) with Minimal Model analysis [64, 65]. Other studies rely on indirect measures of these critical T2DM-related phenotypes. Furthermore, these family-based samples are ascertained on T2DM and not GDM. The BetaGene study has hypothesized that genetic loci underlying susceptibility to GDM have implications for family members and has been studying the genetics underlying T2DM-related quantitative traits in Mexican American families of probands with or without a previous diagnosis of GDM [66–69]. BetaGene has two unique characteristics compared with other genetic studies of diabetes. First, BetaGene is focusing on the analysis of T2DM-related quantitative traits, believing that understanding the biological effects of genetic variation may illuminate key components of the pathogenesis of GDM and T2DM. Second, a large subset of the BetaGene participants have undergone detailed phenotyping, including dual energy X-ray absorptiometry for body composition and FSIGT with Minimal Model analysis to estimate insulin sensitivity and insulin secretion, given the focus on quantitative traits. To my knowledge, BetaGene is the only family-based genetic study ascertained on GDM in the world, as of this writing. The BetaGene study has shown associations between some T2DM susceptibility loci and T2DM-related quantitative traits [66, 68, 69], but more importantly it has shown that these associations are modified by other factors, such as adiposity or other gene variants. For example, variation in TCF7L2 is one of the most highly replicated T2DM susceptibility loci. BetaGene was the first to show that variation in TCF7L2 was associated with GDM , an observation replicated by others . BetaGene also showed that the association between TCF7L2 and OGTT-based insulin secretion is modified by total body fat . A similar modifying effect on the association between TCF7L2 and β-cell function as represented by the disposition index, a measure of β-cell function , was also observed. An interesting observation of this modifying effect of adiposity is that individuals carrying the T2DM 'risk' allele have a 'better' trait value than individuals carrying the 'non-risk' allele in the low body fat range, but this relationship flips in the high body fat range. Figure 2 uses IGF2BP2 as an example of this phenomenon. This figure shows the IGF2BP2 genotype-specific insulin sensitivity (mean ± standard deviation (SD)) in the lowest and highest tertiles of body fat in BetaGene participants . Here, 'risk' allele refers to the allele conferring risk for T2DM as determined by the initial series of GWA studies [37–39]. Insulin sensitivity decreases with each copy of the T2DM risk allele within the highest body fat tertile, which ranged from 38.9% to 54% body fat. This is an expected pattern, given that insulin resistance is a hallmark of T2DM and one might expect that individuals carrying T2DM susceptibility variants might be insulin resistant compared with non-carriers. However, a counterintuitive pattern is observed within the lowest body fat tertile (range 8.7 to 31.7% body fat), where insulin sensitivity increases with each copy of the T2DM risk allele. This observation suggests a different biological effect of the T2DM 'risk' allele in the low compared with the high adiposity range. Modification of the association between IGF2BP2 and insulin sensitivity by adiposity. Genotype-specific means (± SD) were computed for IGF2BP2 rs11705701 stratified by percentage body fat tertiles in participants of the BetaGene study. The lowest body fat tertile is shown on the left and the highest body fat tertile on the right. Insulin sensitivity decreases with each copy of the T2DM risk allele within the highest body fat tertile, but decreases within the lowest body fat tertile. The modifications of these genetic associations by adiposity can be viewed in two possible ways. One is that they represent potential gene-gene interactions, as GWA studies have identified loci underlying susceptibility to obesity and contributing to variation in obesity-related traits [71–78]. Here, body fat acts as a proxy for the effect of one or more of these variants. We have demonstrated examples of gene-gene interactions altering variation in T2DM-related quantitative traits in BetaGene [79, 80]. A second perspective is that they represent the effect of environmental or lifestyle exposures. In this context, body fat could reflect net energy balance, such as the net caloric balance between dietary intake (quantity and composition) versus physical activity (type and intensity). Clearly, additional studies will be required to better understand this complex interaction. The Human Genome Project was initiated to decode the 'book of life' . The idea that the genetic code for humans could be deciphered led to wide speculation about how such information could be used to improve human health, given the genetic predisposition of many common complex diseases. However, the initial results from GWA studies raised questions regarding the utility of genetic knowledge [82–84]. The currently known variants showing association with complex phenotypes, such as GDM or T2DM, account for a relatively small fraction of the known heritability, and this has raised questions about whether gene variants can be used for genetic prediction . The study by Lauenborg et al. and similar attempts to assess the predictive value of gene variants for T2DM [85, 86] support the notion that gene variants alone may not be useful as predictive tools. However, as noted above, genetic prediction models may improve once the functional variants are known, as suggested by a recent study of height by Yang and colleagues . One area in which genetic information may be useful is with regard to family history, which is a strong clinical predictor for many complex diseases such as GDM and T2DM. In many cases, patients are unaware of their family history or have biased information about it. In this situation, susceptibility variants may provide an accurate reflection of the genetic burden carried by individuals and, in conjunction with other traditional clinical variables, may provide improved disease risk prediction. Furthermore, the effect sizes of loci identified so far have been, for the most part, extremely small from a clinical or epidemiological perspective. Individual T2DM susceptibility loci have had estimated odds ratios for risk of T2DM less than 1.5 and the proportion of variance explained for T2DM-related quantitative traits has typically been less than 5%, with similar results observed for GDM [23, 51, 52, 70] and related traits [51, 52, 66–68, 70]. Skeptics have dismissed the practical utility of gene variants in the face of such small effect sizes. However, as elegantly noted by Hirschhorn , the goal of GWA studies and the identification of genetic loci conferring susceptibility to disease is not prediction of individual risk for disease, but biological discovery underlying the pathogenesis of these diseases. Indeed, one of the highlights of GWA studies, as noted above, is the discovery of the potential roles of MTNR1B and CRY2. MTNR1B was identified as contributing to T2DM susceptibility and variation in fasting glucose [45, 49] and variation in insulin secretion , whereas CRY2 contributes to variation in fasting glucose . These loci highlight the potential importance of pathways related to 'clock' genes and circadian rhythms and their subsequent regulation of insulin secretion as contributing factors in the pathogenesis of T2DM. Effect sizes of susceptibility loci should not be equated with biological relevance, as also noted by Hirschhorn . Two specific examples can be gleaned from among the T2DM susceptibility loci. The E23K variant (rs5219) in KCNJ11, the ATP-sensitive K+ channel of the pancreatic β-cell, is a T2DM susceptibility locus with an odds ratio of 1.18 . KCNJ11 is the target of the sulfonylurea class of diabetes medications, highlighting the biological and clinical importance of this gene. The second example is the common Pro12Ala (rs1801282) variant in PPARG (peroxisome proliferator-activated receptor-γ, a nuclear transcription factor), which has an odds ratio of 1.27 for T2DM [34, 89]. Thiazolidinediones are PPARG agonists that act as insulin-sensitizing agents and are used to treat T2DM. Studies also show that treating at-risk individuals with thiazolidinediones may be effective in significantly reducing, or possibly preventing, development of future T2DM [90–94]. Thus, one can confidently state that both KCNJ11 and PPARG have high biological relevance for the pathogenesis and treatment of T2DM. The one area in which genetic variation may be best leveraged for clinical care purposes is pharmacogenetics. The response to a drug - whether in terms of efficacy of treatment or adverse effects - and dosing of medications are not likely to be adversely affected by environmental exposures and tend to have large effect sizes . Therefore, some of the variability in response or dosing could be due to genetic variation. Pharmacogenetics in the area of diabetes is still in its infancy, although there have been studies examining KCNJ11 and sulfonylurea therapy for both rare [96, 97] and common [98, 99] variants and response to thiazolidinedione therapy and candidate genes [100–103]. Results from pharmacogenetic studies could potentially provide physicians with a powerful tool to adjust therapy appropriately for those individuals carrying variants known to affect a given medication. Distefano and Watanabe have recently reviewed the pharmacogenetics of diabetes . Gene-gene and gene-environment interactions are also likely to be helpful to the clinician in making therapeutic decisions. The situation with IGF2BP2 is a good example in which a physician may choose to pay closer attention to the adiposity of carriers of the T2DM risk allele (Figure 2). Studies on the effects of physical activity on loci underlying susceptibility to obesity suggest similar clinical relevance when individuals whose genetic make-up is resistant to the effects of physical activity may require different interventions [105, 106]. The study of the genetics underlying GDM has significantly lagged behind that of other forms of diabetes. However, the dramatic gains made in understanding the genetic basis of both type 1 diabetes mellitus and T2DM in the past few years have important implications for GDM. Testing T2DM susceptibility loci in GDM case-control samples provides evidence suggesting that, at a minimum, GDM and T2DM share common susceptibility loci. Additional studies will be required to determine whether there are susceptibility loci unique to GDM. Loci that contribute to GDM are also likely to contribute to variation in GDM-related quantitative traits, which has implications for offspring. Thus, adverse fetal outcomes associated with GDM or hyperglycemia in general may also have a genetic basis, as evidenced by the interaction between maternal and fetal GCK variants. Ultimately, a well-designed GWA or genome-wide sequencing study of GDM is needed to identify common variants of low effect and rare variants of large effect contributing to risk for GDM. In addition, there is increasing evidence that transcriptional regulation through chromatin modification, such as methylation, acetylation, and so on, may be an important contributor to disease risk. Genomic approaches to assessing chromatin modification are only now being applied to complex diseases and could provide additional insights into the genetic contribution to risk for GDM and fetal outcomes. Identification of loci underlying GDM and GDM-related traits will illuminate the biological basis for GDM susceptibility and provide important clues for improved interventions. However, such new biological insights will require additional detailed studies before they can be translated into the clinical setting. Thus, one cannot expect rapid bench-to-bedside translation of genetic findings. However, current medical training is paying insufficient attention to the coming transformative effect of genetic knowledge. Individualized medicine has not yet arrived and may never become a reality to the extent that has been previously hyped in the media. However, generalized gene-based response profiles to both lifestyle and pharmacological interventions may become a regular part of a physician's arsenal to improve clinical care. I gratefully acknowledge the contributions made by my colleagues in the FUSION and BetaGene studies, as well as my colleagues in the MAGIC, DIAGRAM+, and GIANT consortia that are highlighted in this review. RMW has been a consultant for Merck & Co and Vivus Inc. Takeda Pharmaceuticals North America provides him with pioglitazone tablets for a pharmacogenetics study of pioglitazone monotherapy. He is partly supported by an investigator-initiated research grant from Merck & Co (number 32983).